The Atwater Library traces its origins back to 1828, when the first mechanics’ institute established in continental British North America was formed in Montreal. 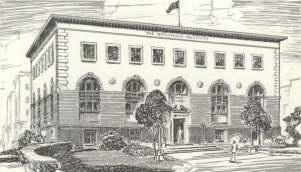 Today, with its official name, Atwater Library and Computer Centre, it is the sole survivor of the many mechanics’ institutes established in Canada in the 19th century. The rest were either closed or merged into public library systems. The Atwater Library and Computer Centre carries on proudly, aware of its traditions, but focused on the future. In 1828, some prominent Montreal citizens formed the Montreal Mechanics’ Institution because they saw a need to educate workers for the emerging industries of the growing city. Patron of the new organization was Sir James Kempt, governor of Lower Canada and first president was Louis Gugy, sheriff of Montreal. Vice-presidents were industrialist John Molson; merchant Horatio Gates; Louis-Joseph Papineau, speaker of the Assembly of Lower Canada, and the Assembly’s representative from the west end of the city; and Rev. Henry Esson, educator and Church of Scotland pastor of the St. Gabriel Street Church. Active members appear to have been mainly artisans, craftsmen and shopkeepers who were employers. Continue reading about our early days, our Heritage building, or visit our Archives page, where you can download the Minutes of the organization, from 1828-1890. More historical articles are found below. Text and research by Susan McGuire. The Atwater Library traces its origins back to 1828, when the first mechanics’ institute established in continental British North America was formed in Montreal. Today, with its official name, the Atwater Library of the Mechanics’ Institute of Montreal, it is the sole survivor of the many mechanics’ institutes established in Canada in the 19th century. The rest were either closed or merged into public library systems. The Atwater Library and Computer Centre carries on proudly, aware of its traditions, but focused on the future. How and why he came to Montreal is unclear. He was born in 1769 in London and, according to Britain’s Dictionary of National Biography, became an engraver accomplished in both line and stipple while studying with Peltro William Tompkins; he engraved several of the series produced in the 1790s by John Boydell for The Shakespeare Gallery.